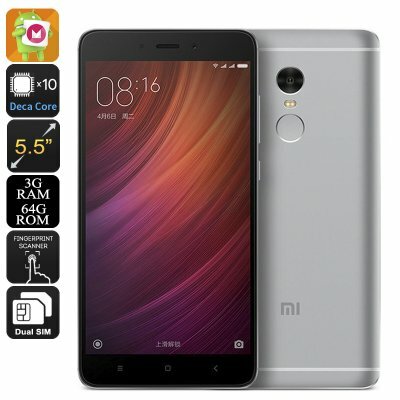 Successfully Added Xiaomi Redmi Note 4 Smartphone - 5.5 Inch FHD Display, Android 6.0, Deca Core CPU, 3GB RAM, 64GB Memory, Fingerprint (Grey) to your Shopping Cart. The Note 4, with flagship grade specifications and an all metal uni-body design is a combinations of precision craftsmanship and western inspired designs. 2.5D curved glass, a full HD display and 10 core CPU rocket its performance to the top end of the charts. This 64GB version boasts plenty of storage space as a micro SD slot allows for an additional 128GB. Alternatively you can use two SIM cards with the Note 4 and enjoy better 4G coverage across multiple providers so its ideal doer frequently travelers and jet setters. The Android 6.0 OS is enhanced by the custom Miui 8 interface brining a unique user experience that's fully customizable. A fingerprint scanner makes access quick and easy with no more codes passwords or patterns to remember while ensuring only allowed access is permitted. With top of the line specs is no wonder the Note 4 comes with an excellent 13MP rear facing camera, great for holiday snaps and nights out. The front camera is no slough either and at 5MP will snap great selfies. Thanks to the phones 4100mAh battery you get a massive amount of usage time so you can use the Note 4 all day without needing to stop to recharge making it a great aid for your busy lifestyle. This Xaiomi Note 4 Smartphone comes with a 12 months warranty, brought to you by the leader in electronic devices as well as wholesale Android Phones and gadgets..